There was no Christmas cheer in the unemployment figures. There was no ray of starlight to illuminate the blanket of gloom in the labour market. This looks like the continuation of a grim process of attrition with job losses announced weekly and the unemployment total rising relentlessly throughout next year. The headline figure of 1.86 million unemployed covers the period up to the end of October. Job loss announcements by companies gathered momentum in November. Those will swell the next set of official figures published in January. The respected Chartered Institute of Personnel and Development predicts "an annus horribilis" for the jobs market in 2009. The narrower claimant count saw its biggest monthly increase, nearly 78,000 in November, since the depths of the last recession in 1991. But the October figure was revised up 15,000. So nearly 100,000 more people are claiming Jobseekers' Allowance than the reported level in early November. The number of jobs in the economy has declined. The fall in financial and business services jobs, down 1.1% in the quarter, was almost as big as the decline for manufacturing where the number of posts fell by 1.4%. This is indeed a widespread downturn with few areas of the economy escaping the effects. Total employment fell by 0.4% in the quarter. But it would have been more if there had not been a rise in public sector employment. Recruitment in the NHS was the main reason for the increase in the number on the government payroll. It's worth noting, though, that employment levels are still higher than a year ago. Government sources make clear there can be no disguising the extent of the downturn. They point out, however, that Jobcentres are better resourced than before and well positioned to advise people on new routes back to work. They argue that there are more than half a million vacancies in the economy. The claimant count of 1 million, officials argue, is not a static pool of people facing long-term unemployment. Many will find jobs within a few months, to be replaced by others who have been made redundant. This feels like a defensive position ahead of a long and painful process. 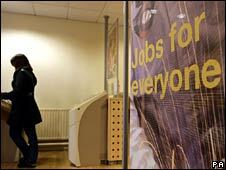 Ministers acknowledge that unemployment will be one of the defining issues of 2009. They won't give their own predictions. They won't be drawn on forecasts of 3 million unemployed on the wider measure. But tucked away in the pre-Budget report is an assumption that the claimant count will reach 1.5 million. Whitehall is clearly braced for many more announcements like today's.